Ingredients for this loaf include: 1 cup buttermilk, 1/2 cup water, 1 teaspoon apple cider vinegar, 4 tablespoons butter (cut into pieces,) 4 large egg whites (beaten until foamy,) 1 1/2 teaspoons salt, 3 cups gluten free baking mix (I used Bob’s Red Mill,)* 3 tablespoons dark brown sugar, 1 tablespoon plus 1/2 teaspoons xanthan gum, and 1 tablespoon plus 1/2 teaspoon bread machine yeast. *In the cookbook, Ms. Hensperger used her own blend of gluten free flours, 1 cup white rice flour, 1 cup brown rice flour, 3/4 cup potato starch flour and 1/4 cup tapioca flour. The Bob’s flour blend includes: garbanzo bean flour, potato starch, whole grain white sorghum flour, tapioca flour and fava bean flour. Apparently the loaf was pretty heavy, my flour substitution may be the culprit there. Mom’s bread machine has a gluten-free setting I was able to use. 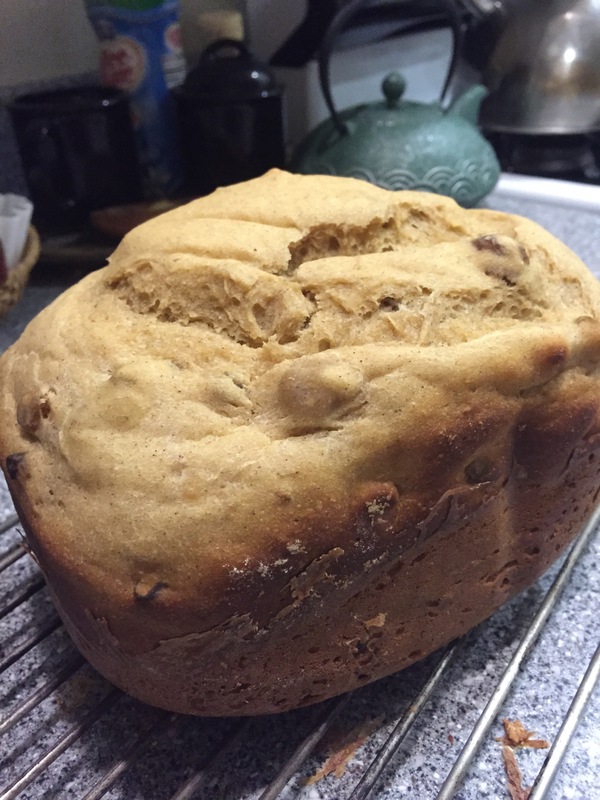 The loaf smelled very nice while it was baking and rose quite high for a gluten free bread. I just got their feedback today. Honestly, Michelle, I have no idea. I want to thank you and Miss Elaine for being my guinea pigs on these gluten free breads. 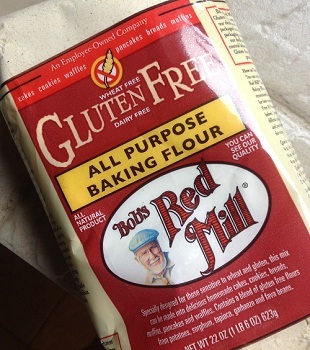 I am attempting my first gluten-free loaf today. My cousin, Michelle, and her daughter, Elaine can’t eat gluten. While they are here for a visit, I decided to bake them a loaf. I drove up to my parents’ place this morning, so I was planning to use mom’s rather ancient bread machine. Ingredients were introduced into the machine in the following manner: 1 1/4 cups water, 1 teaspoon apple cider vinegar, 3 tablespoons walnut oil, and 3 large eggs, plus enough water to equal 3/4 cup. In another bowl, I mixed together 3 cups gluten free baking flour, 1/4 cup dry buttermilk powder, 3 tablespoons sugar, 2 teaspoons xanthan gum, 1 1/2 teaspoons ground cinnamon, and 1 1/2 teaspoons salt. After these dry ingredients were fully blended, I added them on top of my liquid ingredients. Using a spoon, I made a well in the center of the dry ingredients and added 2 3/4 teaspoons bread machine yeast. I set the cycle for basic bread and started the machine. Nothing happened. That is actually not entirely true. Instead of starting to mix the ingredients, the machine made odd noises, smelled bad, and started heating up. I tried shutting things down and trying again, even trying another cycle. Nothin’. I was set to change plans and complete the bread using a mixer and the oven, but mom decided that we should run into town to buy a new machine. I put the pan containing my ingredients into the fridge while we went shopping. First of all, this MAJOR retailer only had 1 bread machine in the store. It was stuck up on a top shelf. Jeez, doesn’t anyone use these anymore? We got back to the house and I got my ingredients back out of the fridge while we opened the new machine and I washed out the new pan. Now I really have to make a decision. I am sure while we were gone, some of the dry and liquid ingredients blended. Also, if I pour the ingredients into the new pan, the liquid ingredients will no longer be on the bottom. Hmmmmm? Rather than waste everything, I will try using this. I have plenty of time, if it fails, to make another loaf. This new bread machine is all fancy-shmancy, it has an actual setting just for gluten free breads. I started the machine (this one works) and when five minutes had passed, I added 3/4 cup of golden raisins. Looks great and the cinnamon smells awesome.